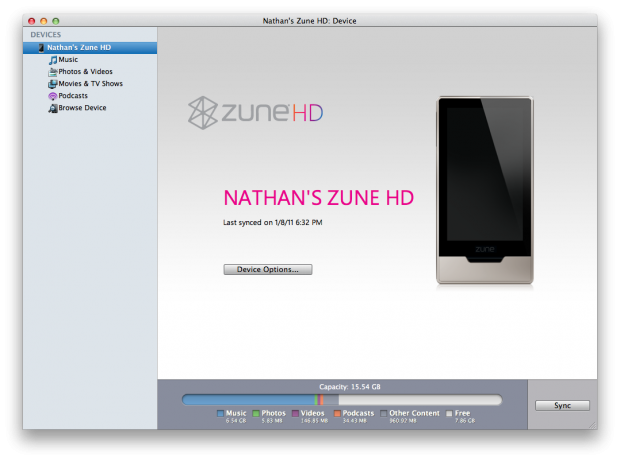 Mac users have been asking for years for a version of Zune for OS X, even if it’s a stripped-down sync utility. The Windows Phone 7 Connector app for Mac is made for use, of course, with your WP7 handset, but apparently a simple terminal tweak is all it takes to make it recognize Zunes as well. The instructions are here; they’re quite straightforward, but be warned, this feature is not supported and may in fact be disabled for good reason. Back up your Zune on your PC before you try this! This could be pretty handy, but it’s also worth noting that the Zune HD has pretty good on-device support for getting and removing music. I wouldn’t have a problem traveling with it and my Mac, even if I couldn’t sync it. Download music from the store, delete directly from the device.